You might be inclined to keep your distance from those gnarly looking tomatoes with the quirky names showing up more often in grocery stores and at farmers’ markets. As a Nutritionist, I encourage you to give heirloom tomatoes a try. Heirloom tomatoes are loaded with health benefits that can, among many other things, reduce stress and strengthen your bones. And don’t be afraid of the odd shapes and diverse colours that signify an heirloom tomato, as these are the result of their rich genetic biodiversity. In short, they are supposed to have lines, bumps and wild colour variation, and as long as the skin has not split, you are in for a treat. Heirloom tomato seeds, like your grandmother’s china, are viewed as precious family treasures, passed from generation to generation. For an heirloom tomato to qualify for heirloom status it has to have been around for at least 50 years. Newer genetic variations are classified as hybrids. Heirlooms are picked at the peak of ripeness, which gives them greater vitamin content. The rainbow of colours indicate their diversity of antioxidants, which help protect your cells from aging. A good heirloom tomato, botanically a fruit, can have the juiciness and sweetness of a cherry or grape. All of that is a sharp contrast to most hybrid supermarket tomatoes, many of which are picked green so they can survive thousands of miles of travel, and are then sprayed with CO2 so they blush red. As well, the skin of these tomatoes is bred to be thick and the flesh sturdy so they won’t bruise easily. All of these so-called ‘improvements’ create a compromise: these tomoatoes lack both the flavour and the nutrients that are created through the natural ripening process. Heirloom tomatoes are a rich source of Vitamin C, which helps to nourish your adrenal glands and reduce stress. One medium heirloom tomato provides 40% of your daily requirement of immune-building Vitamin C.
Heirloom tomatoes add tremendous flavour to your cooking while being low in calories. With only 27 calories per cup, you can enjoy a sun-ripened tomato as a snack, just like an apple! Garnish your next soup or dip with a chopped heirloom tomato for an extra zip. PLEASE NOTE: You will have to limit your tomato consumption if you are a dialysis patient on a potassium-restricted diet. Tomatoes contain an alkaloid called tomatine that may cause inflammation in those who are sensitive. Farmers’ markets are bursting with wonderful varieties. 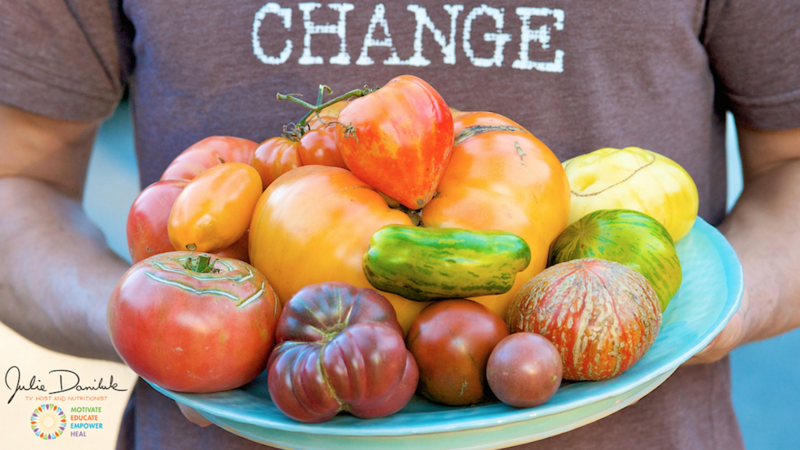 Organic farmers are also selling to natural food stores, nationally. Most of the heirloom tomatoes pictured here were purchased from P & H Farms, east of Toronto. 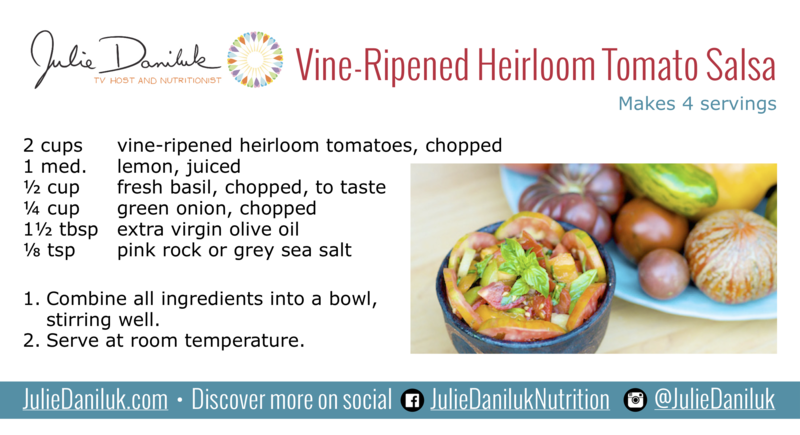 Try my tasty Vine-Ripened Heirloom Tomato Salsa!